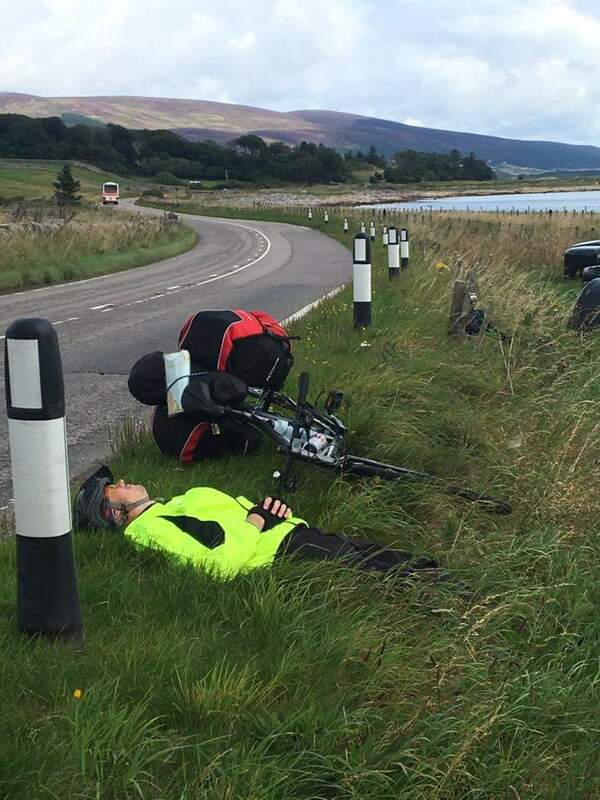 There was a surreal moment during our cycle ride of the North Coast 500 a few days ago. 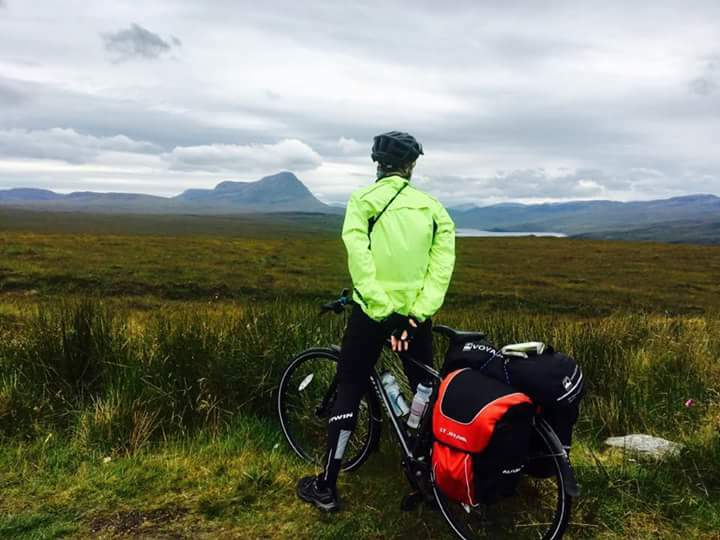 I had pedalled myself to complete exhaustion up and over steep hills for nine days, and my legs had nothing left. I was hurtling down a steep hill into the village of Bettyhill on the extreme north coast of mainland Britain. Traffic was haring past me, and I was struggling to control my bike because a fearsome side wind was causing it to jolt from side to side. I wrestled with it like a cowboy straddling a wild horse. My buttocks were breathing fire because – as anyone who has ridden a bike extensively will know – that’s all part of the experience. I squeezed on the brakes, praying that my steed wouldn’t throw me off just as a car was overtaking. Somehow I managed to stay on and bring my bike to a halt at the bottom of the hill. I pulled into the verge, parked the bike and threw myself on my back. I lay there on the side of the road, a few metres away from passing traffic, only dimly aware of my surroundings. I was in a daze and don’t know whether I fell asleep for a few moments. I have no recollection of pedalling to the top of the hill, only of steaming down it. I was able to realise that I had been in a dangerous situation. I’ve been in dangerous situations on mountains too, but usually I’ve been in control. This time I wasn’t. A few moments later I heard Edita’s voice. I opened my eyes and she was standing over me, offering me food and water, and to pitch our tent when we arrived in camp. But all I wanted was to lie there and get my breath back. Three days later, the same thing happened again outside the village of Brora on the east coast. I pedalled myself to exhaustion and had to throw myself down by the roadside. This time Edita was embarrassed because I was lying in such a way that it looked like I’d been in a accident. She thought passing traffic might stop to see if I was OK. 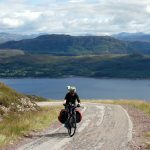 The North Coast 500 was my first experience of cycle touring. Although I know how to ride a bike, I’m not a cyclist. By any stretch of the imagination. I cycle maybe once a year. I don’t have a cyclist’s leg muscles, and I certainly don’t have a cyclist’s buttocks. The North Coast 500 is a 500-mile cycle route around the mountainous northwest coast of Scotland. 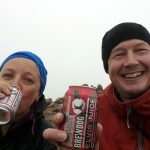 We chose it partly to introduce Edita to the mountains of Scotland, which she has never seen before, but mainly to get in shape for our Ecuador sea to summit. We plan to cycle from the coast of South America all the way up to the foothills of 6310m Chimborazo, then climb it. I thought it might be a good idea to do this with a pair of cyclist’s leg muscles, but unfortunately you can’t buy them in an outdoor gear shop. We completed the bike ride yesterday, after 13 days of pedalling with a bike seat wedged between my crack. It was hard work, but we are relaxing now in the lovely seaside village of Ullapool, looking out over Loch Broom, with the mountains all around us. Today we went on a nice boat trip, saw some seals and a distant Minke whale, and dolphins swam alongside us. For the next week we will be able to do some hill walking. I have dreamed of this moment for most of the last fortnight. In one respect the trip was a success. We’ve had rain and wind and sun, clouds and blue skies almost every day (this is normal Scottish weather). The scenery in this part of the world is amazing. Rocky, emerald green mountains rise up out of the sea, and the coastline wends around sea lochs, looking out towards crumpled islands. And Edita became habituated to more familiar Scottish wildlife. 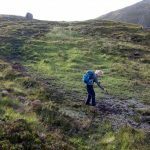 Having spent much of the last year working on a mosquito net distribution project in Africa, she is now determined to start up a similar project here in Scotland. Although the midges here don’t carry malaria, she is preparing some figures on the number of deaths from excessive scratching, which will form part of her application for a research grant. I asked her if she could undertake a similar project to eradicate haggis from pub menus, but curiously she seems to like the taste of haggis. Whether the trip has been successful in preparing me for our Chimborazo sea to summit, that remains to be seen. We have to cycle from sea level to about 4500m. There are no downhill sections to give my legs (and arse) a rest, and it’s now too late to change our plans and make it a Chimborazo summit to sea instead. 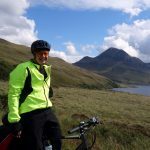 One thing I have learned from this adventure is that I won’t be going on another two-week cycling holiday again, any more than I’ll be going on a two-week running holiday, or walk the West Highland Way with a flaming Primus stove shoved down the back seat of my trousers. As far as I’m concerned, hiking is sooooo much more enjoyable than cycling, and I can’t wait to use my legs for walking again. I will write a more extensive trip report about this adventure in due course. “Buttocks breathing fire” is phrase some of us (well, most of us) might misinterpret. No doubt you were referring the the muscle burn induced by heavy effort. Yes, that must be it.